“Give us love, give us loss, give us all that is in between” well isn’t this record a little treat? This line from the second track ‘It’s what Between That Makes Us Happy’ sums up Flutes in more depth and accuracy than any column print or review perhaps ever could. It is so rare to come across an album that floats around the borders of hope and despair so seamlessly and encouragingly. Produced by Jamie Savage (The Phantom Band, Zoey Van Goey) this record flows incredibly over the piece, Savage has always had an ear for structure without getting in the way of the final product that much is evident with this release. 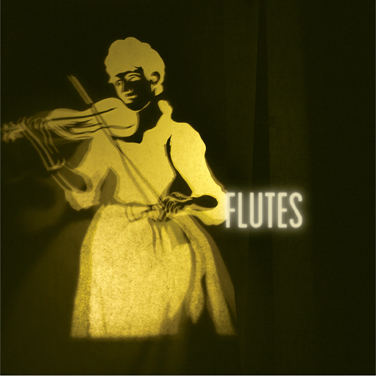 With delicate strokes of folk, melancholy, jazz, pop and rock sprayed beautifully in equal measures; there is something for absolutely everyone in Flutes. Melodies soar in and out of personal favourite ‘Solo Sleep’ as violins and strings slowly build up to an epic conclusion seeped in dramatics and theatrics. ‘Kilburn’ provides satirical commentary on past great poets Byron and Burns, but there is a yearning of the artist trapped within past traditions. Recited poetry is placed against swashbuckling intricate guitars and there is a chuckle to be had at the reference of Byron’s infamous drinking problems. Below the surface, though, there is a very real debate to be found, it has always been an unproven myth that the greatest artists wrote their most renowned pieces when sobriety was lacking. Flutes question this theory, before propelling into ‘This Is a Lift’, which presents the listener with a little antidote of their own. While hardly as recognizable as a piece of poetry from the great Scot or Byronic hero, it does present a bittersweet take on heartbreak and the dissolving of romanticism as a movement. There is a common repetition throughout the album that ties the artist to his work intrinsically, without one the other becomes redundant. On closer ‘Sand’ vocalist Godfrey pronounces that the “keeper of time has your hand,” this reassurance is warming and endearing. As previously mentioned hope and despair are never far from each other over the course of these beautifully layered eight tracks. Like siblings with a love/hate relationship the two very contrasting themes work and understand each other so well. It is fitting that the record closes on a buzz saw of noise, which can be neither identified as slabs of rock or folk. The whole charm of Flutes is that identity is embellished in ideology and tradition rather than one particular genre of music. Why should they deviate from this formula, when it has created an absolute corker of a record?